The geopolitical war is currently being waged for natural resources, such as oil and natural gas. The leading contenders are the USA and Russia, both of which could lead the world directly into World War 3. The superpower showdown is taking yet another twist; Russia is amassing troops on the border of Ukraine, all while the US is moving their nukes from Turkey to Romania. The recent coup in Turkey which was most likely staged by the USA paved the way to destabilize the relationship between NATO and Turkey further. Giving rise to the bettering of ties between Russia and Turkey. Recently Turkey mended fences with Russia and after doing so is attempting to restart the Turkish Stream Pipeline, because without it Turkey may face gas shortages. The Turkish stream is a point of interest for both the USA and Russia because the Stream shows that US sanctions are not holding Russia back in the least. The motive behind the president of Turkey’s mending was to gain ground in the geopolitical war. Not to mention, ever since the attempted coup it would appear as though the USA and Turkey have hit a rough patch as far as relations go. After Erdogan, president of turkey, met with Putin, the announcement came that the Turkish Stream pipeline is going ahead and will be implemented swiftly. 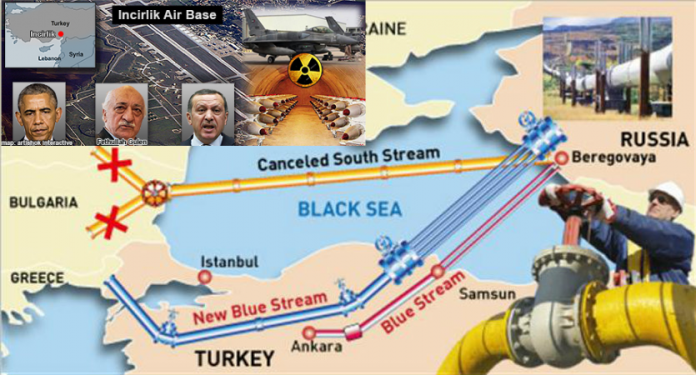 The Turkish Stream project was parked late last year due to the dispute between Moscow and Ankara after Turkey shot down a Russian warplane in Syria. However, with a thaw in relations, the project is expected to be given another life. The pipeline was announced by President Putin in December 2014 during a visit to Turkey. The project was to replace the abandoned South Stream pipeline through Bulgaria. The Turkish Stream pipeline is intended to deliver gas from the Russian Black Sea coast to Turkey and on to Greece. Interject the importance of control of Crimea, and it all begins to make sense. If Russia does not control Crimea, the pipeline would not be safe from the US sabotaging the pipeline. Fast forward, following the mending of ties; Russia begins to amass troops on the border of Ukraine because NATO forces are all gathering along the border of Russia. In May, NATO revealed that it would be sending around 4,000 troops to Poland and the former Soviet countries in the Baltic. Given the number of war games and build up since then for the first time since the Cold War, multinational troops will continuously rotate through four countries in Eastern Europe which escalate the amount of NATO troops numbers not seen since the Cold War. When Turkey and Russia began to mend fences, something out of the blue happened; an attempted coup. The timing of the attempted coup showcases the potential for US involvement in the crisis. However, within Turkey and the Incirlik air base is 50 US tactical nukes which were set in place during the Cold War. Now, given the worsening of ties between Turkey and the US, the US is beginning to move its nuclear arsenal into Romania. Given the unclear timing of the movement of the nukes, it would appear as though Russia, sending 40,000 troops to the border of Ukraine, is in direct response to the tactical nukes heading to Romania. “Russian units will likely practice reinforcing the [Crimean] peninsula through such activities as amphibious landings and air defense exercises, and this may involve the change out of equipment and long convoys of military vehicles,” one defense official said. Right back to the beginning, where both the US and Russia almost took the world to World War 3, fighting for control of Ukraine. Both the US and Russia destabilized the peninsula of Crimea. Now, it would appear as though something similar is in the deck of cards for the rest of Ukraine. GET TO ZE FUCKINNN BUNKAHH!!!!!!!!!!!!!!!!! WW3 IS UPON US.